Between 1965 and 1969, Jean McEwen moved away from his all-over painting style and his use of oil paints, and began experimenting with acrylic paint and hard-edge abstraction, which was prevalent at the time in both New York and Montreal. 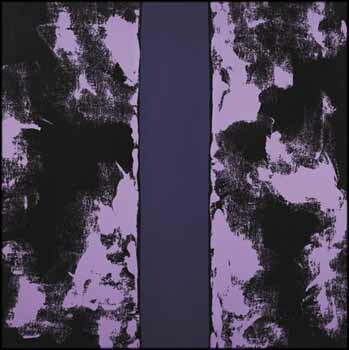 Many canvases from this period, including Sans titre, took on a format in which a centrally placed vertical band of solid colour is bordered by two panels of contrasting pigments. By using this format, McEwen was able to explore the possibilities of hard-edge style, while also maintaining his affinity for gesture. Colour, too, was of the utmost importance to McEwen. As Constance Naubert-Riser explains, "McEwen has devoted his entire creative output to exploring the power of colour while providing it with a structure, all with the aim of revealing the qualities of depth inherent to it." The juxtaposition of Sans titre's intense violet centre, solid and straight as a rail, against the swirling, creamy lilacs and inky blacks dancing alongside it demonstrates his command of colour brilliantly.